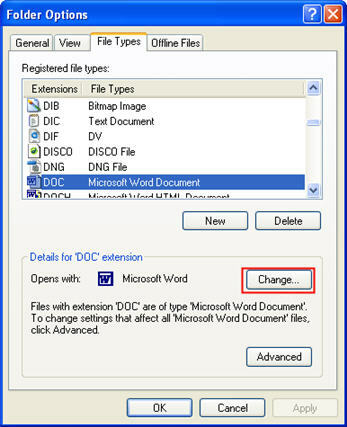 When you assign a file extension to a file, you tell Windows what type of file it is and what program should be used to open it. This file association can be changed by opening Windows Explorer and selecting Tools, Folder Options, and then File Types. 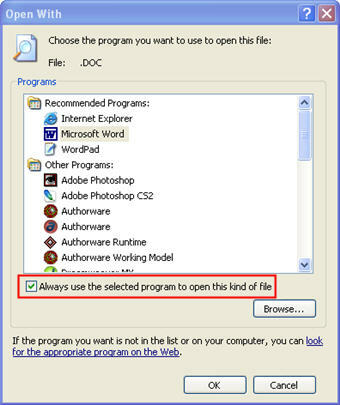 You can then select an existing file association and click on the Change button to change the program assigned to opening that kind of file. A dialog box will open up where you can select a program from the list or use the Browse button to locate the program on your hard drive. To permanently change the file association, you must make sure the checkbox next to “Always use the selected program…” is selected. 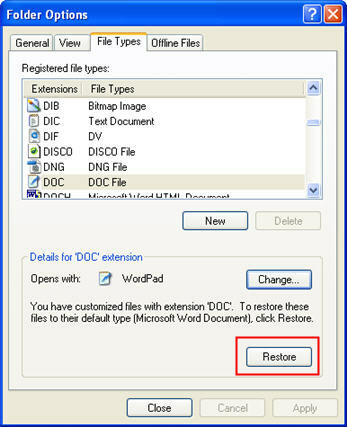 When you click on Ok the file association will be changed and you will be returned to the Folder Options dialog box. At that point you can still restore the file association to what it was before you made your change by clicking on the Restore button.